A part of a flat-plate solar collector that provides a surface for absorbing visible light solar radiation. Air infiltration is the unintentional or accidental introduction of outside air into a building typically through the windows, doors and cracks or penetrations in the building envelope. 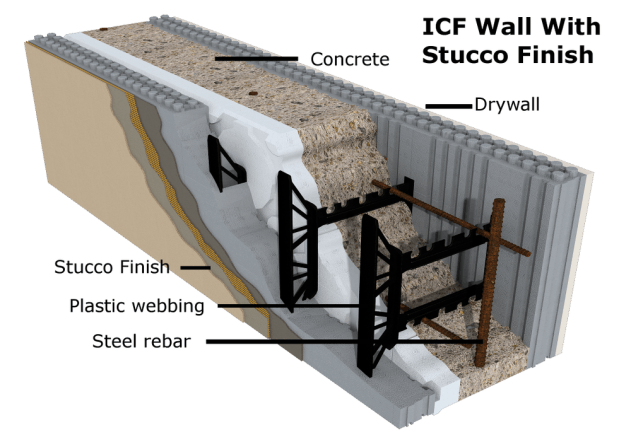 An insulated concrete form (ICF) Thermal Wall Technology structure is exceptionally tight and in many cases requires mechanical introduction of fresh air. This provides the occupant the ability to control the amount, filtration and humidity of the incoming fresh air. The temperature of the surrounding medium. In the text referenced on this site it represents the outside temperature. CMUs are concrete blocks. CMUs come in a variety of sizes, shapes and surface finishes. The CMUs can be rebar reinforced to provide substantial strength. In a TWT application following placement of the hydronic tubing the cores would need to be filled to supplement the thermal mass and provide thermal conductivity. One advantage to the CMUs is they are offered in a variety of surface finishes to facilitate interior facades. Research is also underway to determine the feasibility of TWT construction utilizing a concrete masonry unit (CMU) (concrete block) or Architectural CMUs. Initial indicators suggest CMUs could be utilized in many TWT applications. The domestic hot water system (DHW) are the components used to provide hot water for the kitchen, bathroom and other appliances. Resistive heating is the process by which an electric current passes through a conductive material (the resistor) and releases heat. The greater the resistance the electricity encounters, the more heat is created. This is an expensive form of heat and typically utilized for temporary heating or in small spaces. Electromagnetic radiation (EMR) is the radiant energy released by all matter above the temperature of absolute zero. EMR comes in varying degrees of energy from high energy Gamma and X-rays to middle spectrum EMR such as visible light and infrared radiation to low energy radiation such as radio waves. The two spectrum's of energy related to the TWT is visible light and infrared radiation (IR). Expanded polystyrene (EPS) is a form of insulation in which tiny beads of polymer are expended to entrain air and create insulation. EPS board is a form of board insulation in which the beads have been pressed together with a gluing compound to form a board insulation. EPS is used in combination with Insulated Concrete Forms. Flat plate solar collectors are solar collectors utilized to capture visible light and create hot water. The visible light heats the absorber plate which incorporates copper tubes containing a water solution. The water solution is then circulated from the collector for domestic hot water or space heating. Forced air heating is a conventional method of heating/cooling in which the air is heated using natural gas, heat pump, etc. and then circulated (typically) through air ducts to different parts of the structure. Forced air cooling systems utilize a heat pump or dedicated air conditioner. Evaporative coolers which chill the air through the evaporation of water are also used in arid regions. A heat pump is a device that through the circulation and compression/expansion of refrigerant gases, transfers heat to or from a structure. In terms of heat, heat pumps can produce 3 or 4 times the amount of heating as direct electrical resistance heat. Hydronics is the use of water or another liquid heat transfer medium such as glycol in heating and cooling systems. Some of the oldest and most common examples are steam and hot-water radiators with solar collectors being a newer technology. 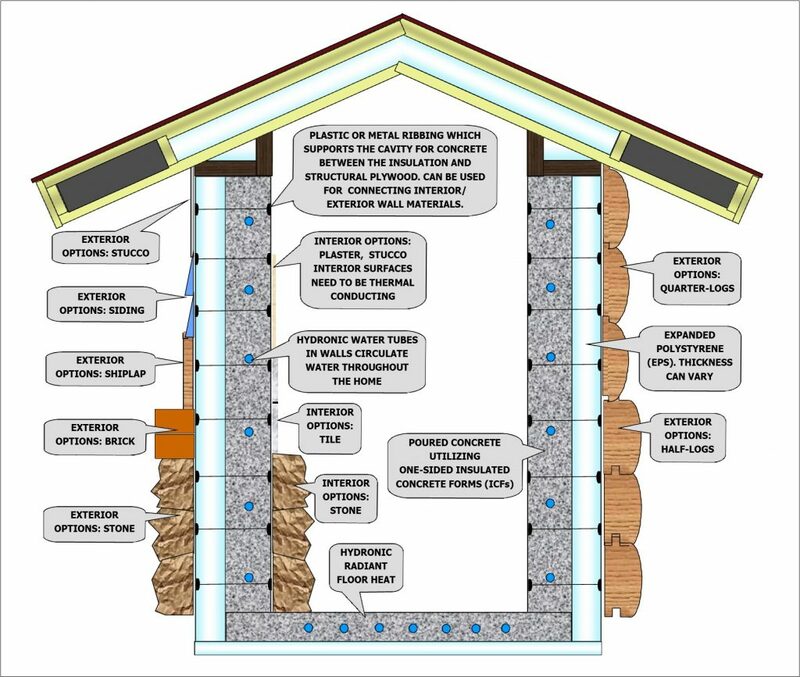 The Thermal Wall Technology utilizes hydronic distribution to transfer the low-level energy to the walls and floors. Hydronic distribution is the distribution and circulation of water/glycol throughout the Thermal Wall Technology structure. Infrared radiation (IR) is an invisible form of electromagnetic radiation. Also referred to as infrared heat and radiant heat. This is the energy we feel when sitting at a campfire, standing next to a cast iron radiant heater or from the heat of an electric stove-top burner. The form of energy emitted from the Thermal Wall Technology walls and floors is IR. IR has the ability to travel through air or a vacuum and heat the object it impinges upon. Insulation is a material or substance that is used to retard heat, electricity, or sound from going into or out of something. Wood frame structures typically use a fiber glass insulation between the wood studs. In the Thermal Wall Technology structure expanded polystyrene (EPS) board is utilized on the outside of the thermal mass. Insulating concrete forms or insulated concrete forms (ICF) is a system of formwork for reinforced concrete usually made with a rigid thermal insulation (expanded polystyrene (EPS) board) that stays in place as a permanent interior and exterior substrate for walls, floors, and roofs. The forms are interlocking modular units that are dry-stacked (without mortar) and filled with concrete. The units lock together somewhat like Lego bricks and create a form for the structural walls or floors of a building. ICF construction has become commonplace for both low rise commercial and high performance residential construction as more stringent energy efficiency and natural disaster resistant building codes are adopted. Kinetic energy is a form of energy that results from an object's motion. There are many types of motion that use kinetic energy; translation (moving from one place to another), rotation, and vibration. Kinetic energy referenced on this site is considered vibrational, the transfer of energy from one atom to the next. If you hold your hand over a hot electric burner on a cook top you can feel the infrared radiation (heat), if you touch the burner you feel the kinetic energy. The hydronic water tubes deliver heat to the interior of the Thermal Wall Technology wall and the heat in the form of kinetic energy moves through the wall to the surface where it is then released as infrared radiation. A net-zero energy building is a building with zero net energy consumption, meaning the total amount of energy used by the building on an annual basis is roughly equal to the amount of renewable energy created on the site. By utilizing the Thermal Wall Technology it becomes far easier to achieve net-zero energy status. Off-peak refers to lower, discounted electricity prices during specific times. Off-peak times are generally when residential homes and businesses use less electricity. Off-peak times will vary depending on your location and meter type, but typically are at night or weekends. This is the temperature range a particular system best operates within. All heating systems have an operating temperature range and optimum operating temperature. The lower the optimum operating temperature the more efficient the system can operate. Passive solar is the use of the sun’s energy directly for heating purposes. Unlike photovoltaic or other technological solar power applications, passive solar does not involve energy gathering or transformation through mechanical or electronic means. 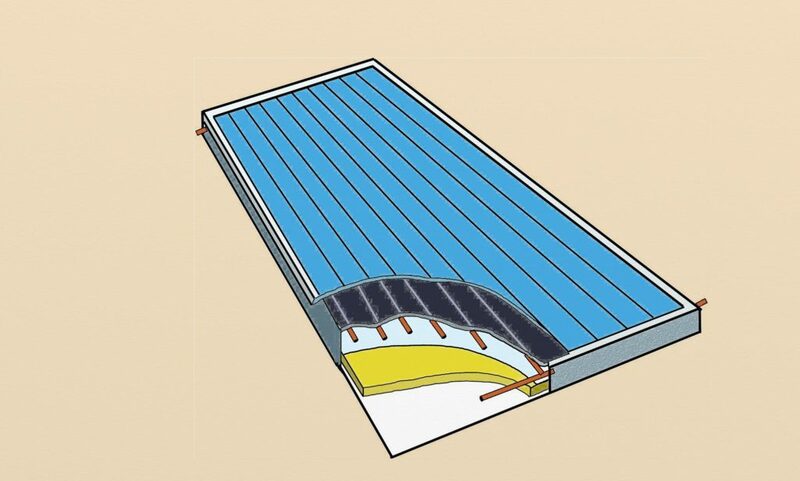 In the Thermal Wall Technology structure sunlight is obtained directly from the south-facing windows, however, in the Thermal Wall Technology structure the heat energy from the sunlight can be transferred via the hydronic tubing to other non-passive solar parts of the structure. Photovoltaic (PV) collectors are collectors that can directly convert sunlight to electricity. The Thermal Wall Technology will substantially reduce the electric operational demand of the structure. PVs will be incorporated into the 3RD Millennium Project in order to illustrate and calculate the reduced electrical demand and to achieve net-zero energy status. By reducing the electricity demand of the structure, size and cost of the PV system is reduced further promoting net-zero energy construction. Radiant floor heating is a form of heating in which either hydronic tubing circulates hot water or electric resistance heating is utilized in the floors. 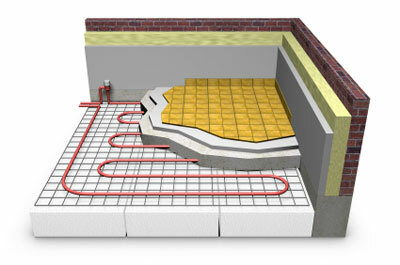 In the Thermal Wall Technology structure hydronic radiant floor and wall heating is utilized. 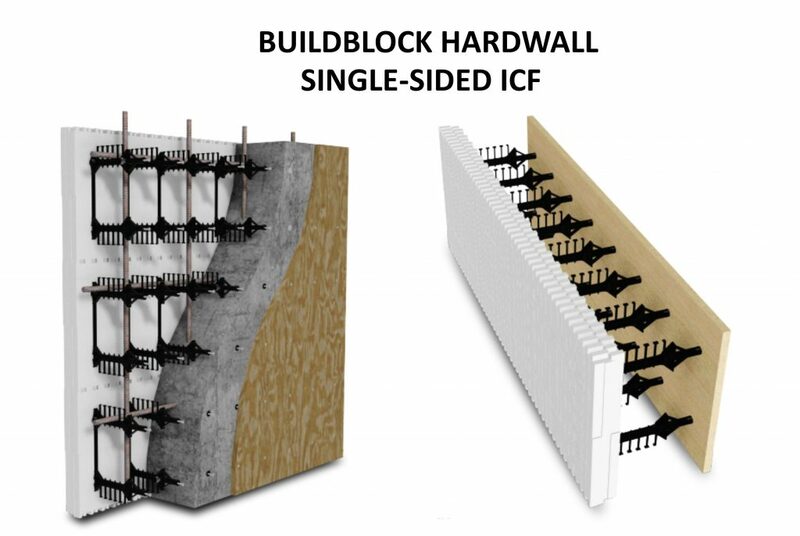 Single-Sided Insulated Concrete Forms (SSICFs) is a modified Insulated Concrete Form (ICF) in which one of the expanded polystyrene (EPS) panels is replaced with a removable/reusable plywood panel. In the Thermal Wall Technology structure the removable plywood panel is placed on the interior of the structure enabling the thermal mass of the concrete to thermally communicate with the interior. Solar thermal hydronic system also referred to as Solar Thermal Systems is the components of the solar heating system including the collectors, connecting hydronic tubing, pumps, sensors and hot water storage. See Flat Plate Solar Collector. Space cooling is the action of removing heat from a structure. A heat pump or dedicated air conditioner is typically utilized in moderate to high humidity regions with a forced air delivery system. Evaporative coolers which chill the air through the evaporation of water are also used in arid regions. Supplemental hot water storage is the storing of excess hot water typically generated from a solar thermal system. In a Thermal Wall Technology (TWT) structure hot water can be collected for the thermal walls/floors, domestic hot water (DHW) and supplemental hot water. Amelioration is the act of making something better or less harmful. Thermal amelioration is the process of taking something too hot or too cold and making better. In the case of the Thermal Wall Technology the thermal mass of the structure mirrors more the 24-hour average temperature than the daily extremes of a low thermal mass wood frame structure. Thermal conductivity (TC) is ability of a material to transfer heat through it. Different materials have different rates of thermal conductivity. Copper for instance has an excellent thermal conductivity of 400 (Btu/(Ft H F)) while pine has a thermal conductivity of 0.15 (Btu/(Ft H F)). Concrete utilized in the Thermal Wall Technology structure has a thermal conductivity of 1.0 (Btu/(Ft H F)). In building design thermal mass is a property of the mass of a building which enables it to store heat providing "inertia" against temperature fluctuations. It is sometimes known as the thermal flywheel effect. The thermal mass capacity of a Thermal Wall Technology wall is approximately 19 times that of a typical wood frame wall. Thermal mass absorption is the ability of the thermal mass to absorb heat or release heat. In the Thermal Wall Technology (TWT) structure the thermal mass is concrete, however, in the TWT structure the thermal mass is exposed to the interior enabling it to radiate warmth in the winter and to absorb heat in the summer. Thermal Wall Technology is a new holistic construction technique which transforms the shell of a structure into a heat storage and delivery system which also provides in-situ cooling. The visible spectrum is the portion of the electromagnetic spectrum that is visible to the human eye. Electromagnetic radiation in this range of wavelengths is called visible light or simply light. The visible light spectrum has the ability to travel through the glass of windows, eyeglasses and the glass on solar collectors. In the case of a solar collector the light is absorbed on the collector absorber plate and converted to kinetic energy (heat). From there the kinetic energy is absorbed by the water/glycol solution circulating through the collector and then is delivered to either the thermal walls, supplemental hot water storage or domestic hot water. Once the light is absorbed by matter it then degrades to invisible infrared radiation (IR). IR, however, cannot travel back through the glass like visible light. To escape it must be absorbed on the surface of the glass and then travel through the glass as kinetic energy and the radiate from the exterior surface of the glass. Wood frame construction is a method of construction utilizing traditional wood studs with lightweight insulation. This type of conventional construction has served humankind well, however, the energy requirements for this type of construction is unsustainable.